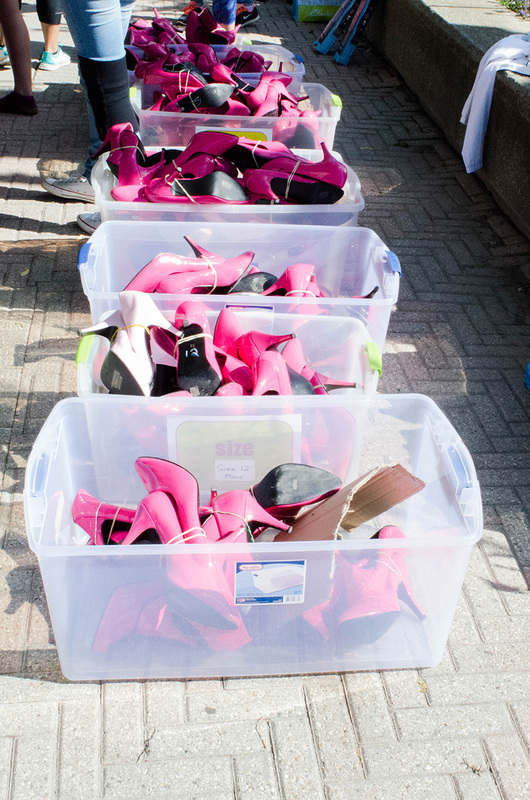 The awkward clacking of dozens of high heels on pavement echoed down Lakeshore Road East in Oakville the morning of Sunday, Sept. 27. 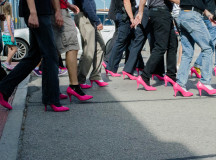 About 65 men wobbled 800 metres down the road in hot pink heels to support the cause to end violence against women. 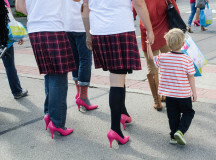 Burlington hosted its sixth annual Hope in High Heels fundraiser Saturday, followed by Oakville, which held its fifth walk. “Men let their friends know what they are doing and they end up getting a lot of support,” said Carmela Bozzo, development manager at Halton Women’s Place. 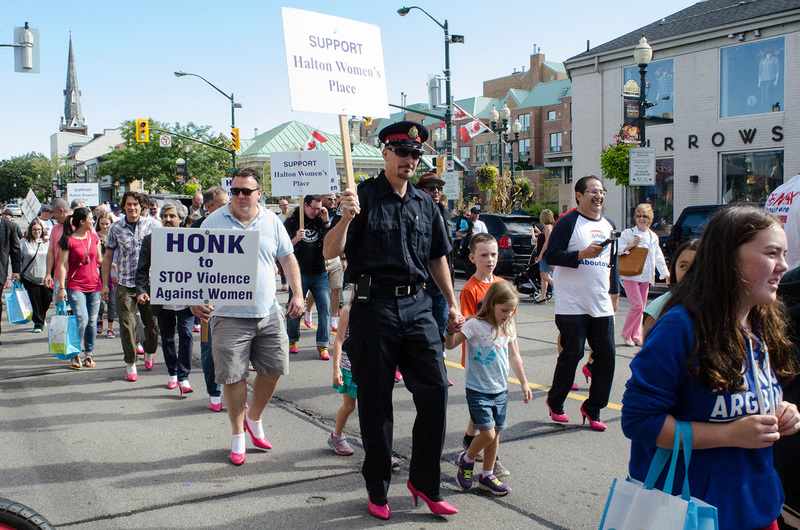 As a non-profit organization, Halton Women’s Place runs the event every year to raise awareness about violence against women and children. “We need to recognize it is happening in Halton,” says Bozzo. Men of all ages stumbled for the cause. Many formed teams, including police officers, firefighters and real estate agents. One of the sponsors was Clarks shoes. Photographer Mike Highfield walked with his girlfriend Bianca Bernardi and her father Sonnie, for the second year in a row. “You get to raise awareness by being here. It’s just a fun time and it’s a good way to get involved in the community,” says Highfield. Bob Lush, 77, has been participating for four years. A retired lawyer, Lush arrived early this year. 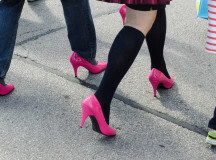 That’s because last time, he wound up with a pair of heels three sizes too big. 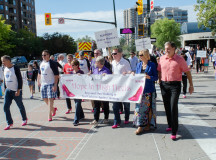 The walk allowed everyone who participated to spread the word about abuse and help support the women and children around them. The hope is that the event will bring more help to many women who seek refuge at Halton Women’s Place every day. “Last year we served about 1,185 women and children and our crisis counsellors answered about 1,125 calls,” says Bozzo. Halton Women’s Place has 52 beds, provides transitional support, counselling, food, clothes and daily necessities. The Burlington and Milton shelters are the only ones in Halton. 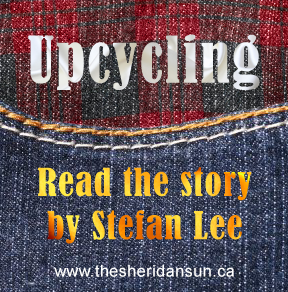 “Our capacity was at 102 per cent most of the summer. Every one of our 52 beds was filled with a woman and her child,” says Diane Beaulieu, executive director of Halton Women’s Place. 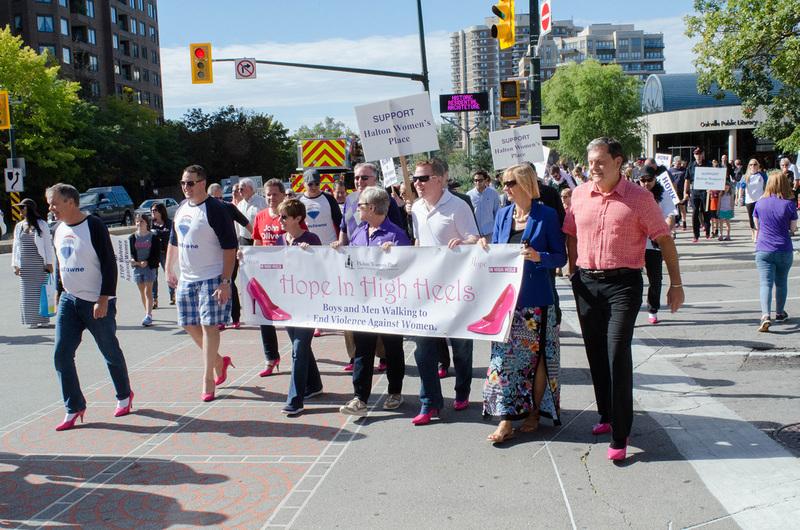 This year the Hope in High Heels event raised approximately $100,000 for shelter needs such as clothing, linens, educational materials, kitchen and cleaning supplies. Even with the donations and money raised, getting the issue out into the community is the agency’s biggest goal. 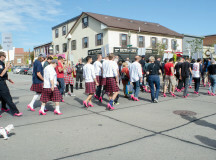 Many sizes of pink heels awaited the male participants last Sunday morning for a short walk down Lakeshore. 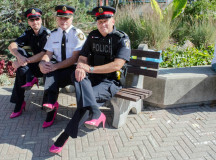 Men trade shoe sizes for comfort at Halton Women’s Place Hope in High Heels event on Sept. 27 2015. 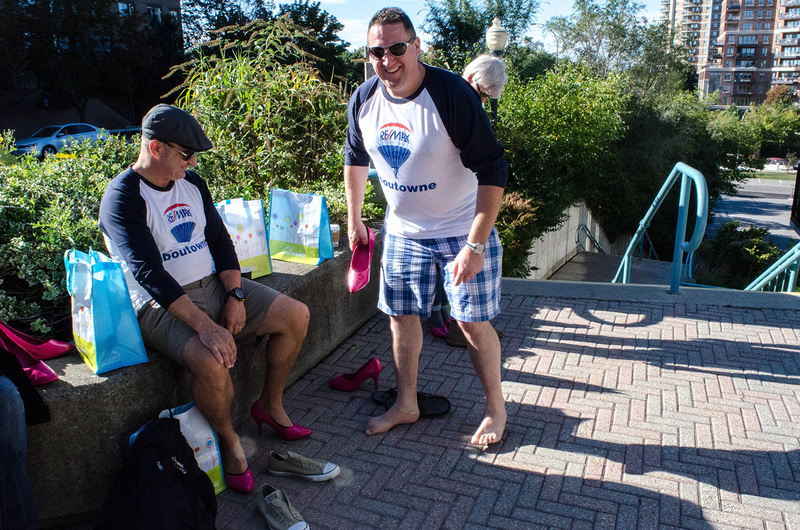 Two men from the ReMax team having fun finding their shoe size before the Hope in High Heels walk begins. 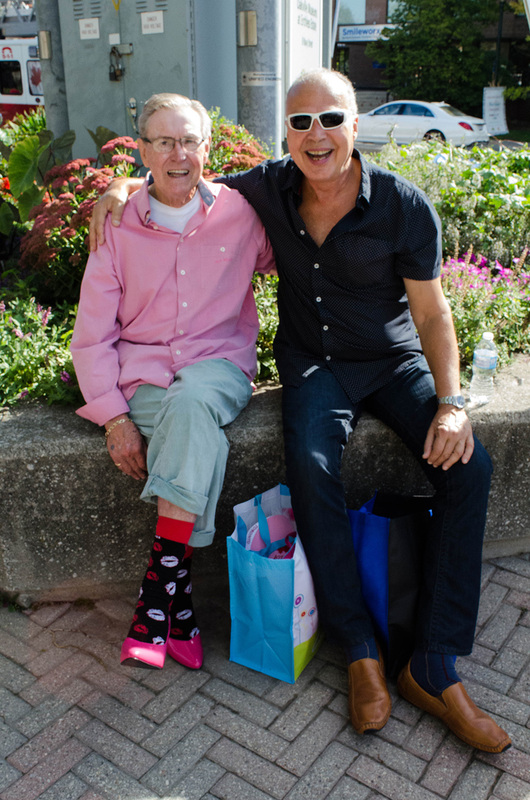 Bob Lush with Russ Little at the Halton Women’s Place Hope in High Heels event. 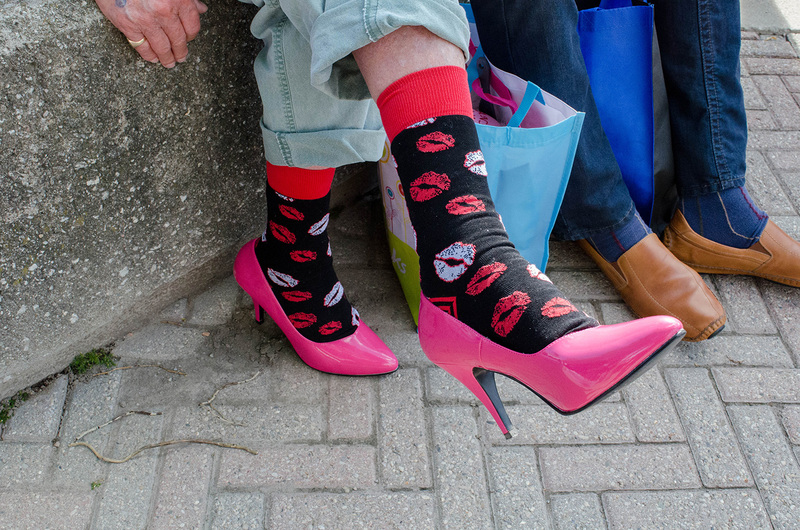 Bob Lush, 77, sports his pink high heels with fancy socks at the Hope in High Heels awareness event. 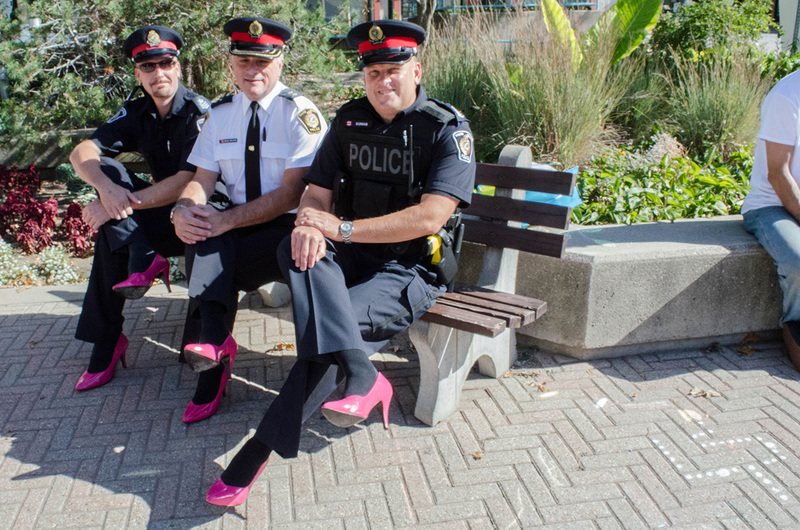 Halton police pose for a shot of their hot pink heels before the Hope in High Heels walk. 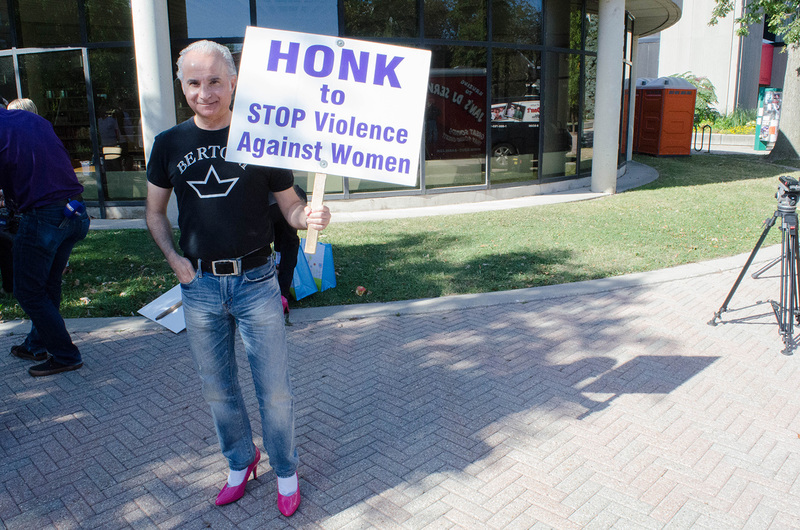 The start of the Hope in High Heels walk event to raise awareness for violence against women, held in Oakville on Sept. 27, 2015. 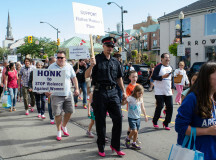 The men strut their stuff down Lakeshore in Oakville to spread awareness for violence against women. 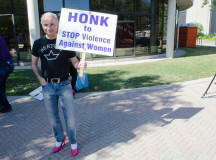 Men walked with signs to grab the communities attention at the Halton Women's Place Hope in High Heels event. 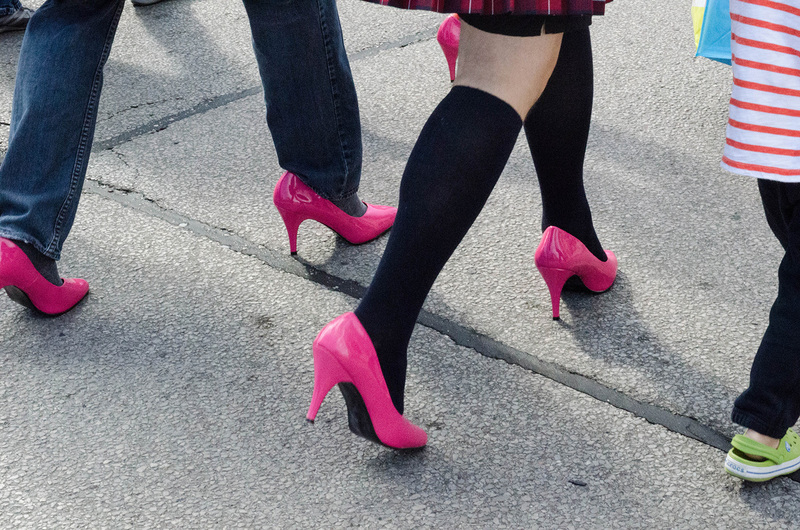 The pink heels clacked on the pavement as men walked to raise awareness for violence against women and children. 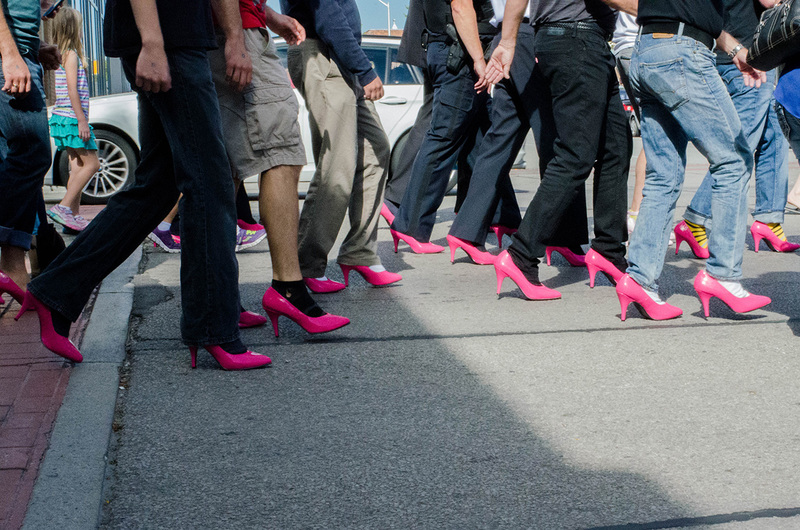 About 140 men walked down Lakeshore in support of Hope in High Heels event in Oakville. 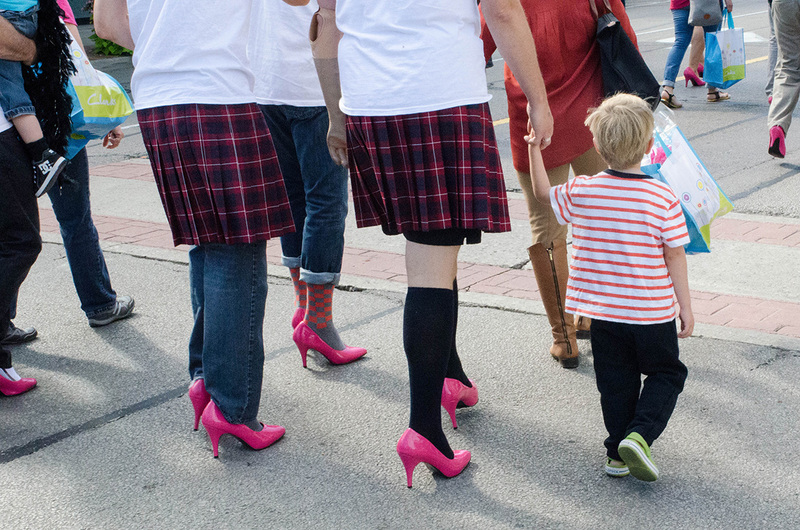 Many of the male participants walked alongside their children and families for the Hope in High Heels event. 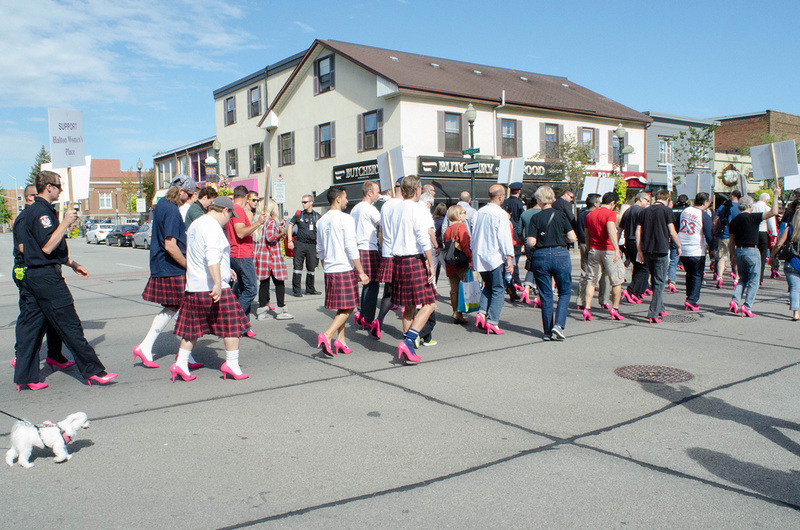 Two men from the kilt team walked with their families to show support for violence against women and children on Sept. 27 2015. Added by brittanypreocanin on September 29, 2015.